Dr. L. B. Smith, U.S.A.
Puya raimondii with flowers and from a place nearby where 135 years ago it was seen for the first time by A. D. D'Orbigny. HE FIRST NATURALIST TO SEE Puya raimondii Harms was apparently A. D'Orbigny, who saw it between Cochabamba and Santa Cruz, Bolivia, in October, 1830. In his "Voyage dans l'Amerique Meridionale" he remarks that he was astonished by a large isolated and roundish plant on a grassy slope where no other trees were seen. When he approached the plant, of course not in flower, he thought it was an Agave. The name of this giant Puya commemorates the well-known Italian scientist Antonio Raimondi, who resided in Peru for many years and made wide botanical explorations there. He discovered this species in Peru and published it as Pourretia gigantea in "El Peru," Volume 1, Page 297, 1874. 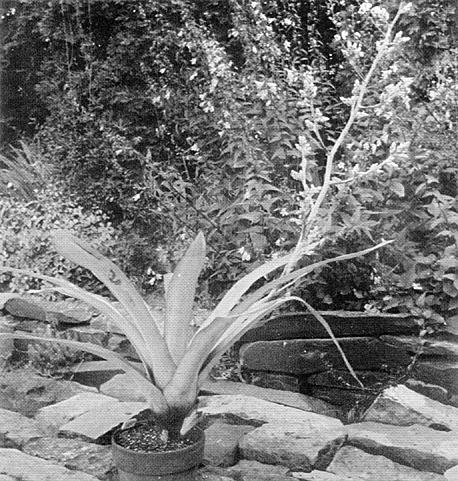 As the epithet "gigantea" had already been used in Puya by Philippi for a Chilean species, the botanist Harms renamed the plant for Raimondi in 1928. The great German botanist T. Herzog, in 1911, took pictures of about fifty P. raimondii in full flower on the Andean slopes near Araca, Dept. of La Paz, Bolivia. Probably no other scientist has ever seen such a magnificent sight. 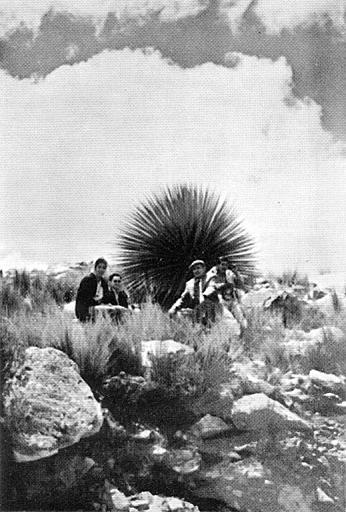 In September, 1951, I saw Puya raimondii in flower between Cochabamba and de Huakanqui, at 3400 meters altitude, and showed him a Puya raimondii in flower. We both took pictures in kodachrome. A picture by Foster was published in the National Geographic Magazine in October, 1950, and shows a ladder against the Puya to let a boy climb to the top and collect the flowers. The other picture in that article, without any people around the plant, was taken by me. Later we saw P. raimondii at the granite quarry of Comanche near La Paz at 3800 meters altitude. In September, 1951, I saw Puya raimondii in flower between Cochabamba and Santa Cruz at a place called Kayarani, which, in Quechua, means "place of Puya." I had two boys collect nectar from the hundreds of flowers into a jar, and took motion pictures of this plant with a large hummingbird flying around its flowers. In January, 1966, while traveling the same route as D'Orbigny, I saw near Vacas Lakes, hundreds of Puya raimondii. These were not flowering and looked very much like Agaves, with each plant forming a giant ball of leaves. I took pictures showing this striking ball silhouette. Seeds were taken to send to the University of California Botanical Garden, Berkeley, California. Later this year I plan to visit again the Vacas Lakes, where there are so many hundreds of plants of this rare species in the hope that I will find them in flower. EDITOR'S NOTE: Although this is definitely not a plant for the home garden, many members have written asking about seed. Those who attempt to grow this largest of all bromeliads should remember the following: It likes high altitudes, around 10 to 12,000 feet; it will eventually have a circumference of eight feet and attain such a height that it would take a long stepladder to reach the first flower; that it lives for approximately 150 years and like all bromeliads does not bloom until it is mature; that after it flowers, the plant dies. VER THIRTY YEARS AGO I was staying with my grandmother, and one day she took me to visit a friend of hers. On the table our hostess had a bowl of flowers which absolutely fascinated me. I had never seen anything like them before and just could not keep my eyes off them. Their owner had no idea what they were. She said that there had been a huge clump of them in the old garden when she moved into the house. I never forgot those flowers and was always on the lookout for them, but many years passed before I saw any again. By that time I had married and had a garden of my own. A new friend had some of these plants in her garden and she gave me an offshoot. I was thrilled to have it, but I still had no name to give this plant. Not long after, I became bitten by the "cactus bug," and through this interest met the late Mrs. Muriel Waterman. She had a wonderful collection of cacti and succulents and was very helpful in leading me along the prickly path. Also, she gave me a name for my "mystery plant." It was none other than our old friend Billbergia nutans! Through Mrs. Waterman I met a number of other cacti enthusiasts, all of whom grew bromeliads along with their cacti. I was given a number of bromeliad offsets and for years grew Billbergias and one or two Aechmeas. I always liked them and bought an odd plant from time to time. One cactus collector had some very good bromeliads, and I bought several from him and also from the Society Trustee, Harry Martin. One of these was a lovely plant with soft pink leaves. I never did know the name. It got scale badly and I sprayed it. I killed both the scale and the plant! Had I known as much as I know now I would have kept the stump and probably gotten some offsets. As it was, I threw it away and I still regret it. About this time I saw my first Tillandsia lindenii in flower. I fell in love with it immediately! Those gorgeous flowers - and my favorite blue! I just had to have a plant. I managed to get one and looked forward to the time it would flower. Years passed, and the plant grew but flower it would not. I tried growing it in the house, outside, under trees, and in all sorts of different containers and mixtures. Eventually a heavy frost killed it. I obtained another plant; surely, it would flower. It grew well, but never bloomed. That seemed to be a cross I had to bear, but I was determined not to be beaten! Most of my bromeliads had been kept on an open porch, and it really was a wonder that they grew as well as they did, for I was still very much cactus-minded and the bromeliads got much less water than they really required. When my husband built me a small glasshouse for my cacti, I moved some of the bromeliads there but discovered that it was much too hot for them. My interest in bromeliads seemed to wane for a time, but it picked up and I sent away for some plants from overseas. When the bromeliads came, I had a marvelous time. They were beautiful plants and looked as if they had just been taken out of their pots. The prices were reasonable too. Then I got the account for the air freight. I nearly fainted! I still have some of the offspring of those plants. My next venture was to send for some seedlings from Germany. These too, arrived in perfect order, but I was rather amused to see that some looked just like grass. These seedlings were put out on the porch and grew very slowly under their spartan conditions. I had a visit from Harry Martin one day and offered him a root of my "grass." He took it. Many months later when I was looking at his plants, I noted a most attractive one; he informed it was the "grass" I had given him! Occasionally I visited Mrs. Waterman and drooled over the beautiful bromeliads that she had. She had a number anyone could buy, but the choicer plants she would sell only to members of the Bromeliad Society—a sort of blackmail we used to tell her. Knowing how much I wanted some of the plants, my husband joined the Society so I could get them. I am afraid the bulletins were rather beyond me in those days, though I did enjoy looking at the pictures. I eventually gave them away—how I wish I had kept them. All this time I was busily admiring Tillandsia lindenii in other collections and bemoaning the fact that mine still would not flower. At Harry Martin's home, there were plants just lying around and all flowering madly in spite of the fact that they were not even planted. By now the porch was overflowing, and I had to do something about it. 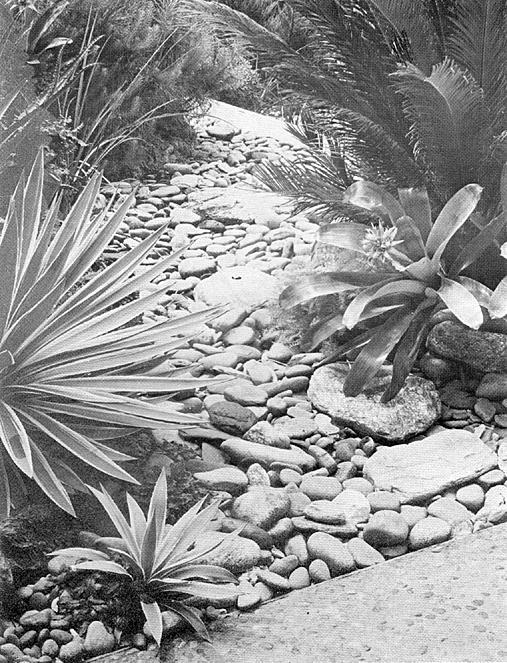 I had a rockery, which started out as a cactus garden, but many of the plants had grown too large. Out they came, and a clean sweep was made of all other plants. I added some new soil and planted a selection of Billbergias, a few hardy Aechmeas, one or two Dyckias, and Hechtia texensis. All these plants did well. In winter I covered them with newspapers, as we often have a wet night with frost, a situation which isn't too good for any plants. All my visitors admired this rockery, and it certainly did look colorful. However, this last winter we had three weeks of frost and practically every plant was ruined. I left them all in the ground and have been thrilled to have offsets on practically all of them. Congestion was now really a problem—the rockery was full and the porch was full. There were bromeliads in the trees, in the shrubbery, and even pots of bromeliads in the carport. Loving husband came to the rescue. "I think I had better build you a lath house," he said. He cut the laths on a small circular saw and then creosoted them—this to do away with painting. The roof of the house was made of glass, and polythene was put on the side of the prevailing wind. Soon the benches were built and everything was in readiness for my moving in. As my husband left for work, he said I might as well move in some of the plants, as there was only a little more to do. When he came home, all the benches were full. All the poor man could do was to lean against the door and gasp, "Where the dickens did all those come from?" With the arrival of winter, we had some troubles. The roof leaked, and I was puzzled to find a number of plants turning brown for no obvious reason. In the end we decided that the bromeliads were being affected by the fumes of the creosote: I had moved in too soon! We decided we would have to do something about the roof, so we bought some dear and unbreakable plastic. Since it has been up, the plants have really colored and look beautiful. By now we had formed the Bromeliad Society of New Zealand, and "Bromel Fever" was affecting us all. As for me, I found my love of Tillandsias growing daily. I added a number to my collection and they all did well and flowered, which is more than I can say for my temperamental T. lindenii. The Society, imported a number of plants from Dr. Oeser in Germany, Many such plants we ballot at our meetings, so all will have a chance to get them. I have taken up pottery so that I can make unusual containers to complement my plants. It is impossible to purchase anything unusual in New Zealand. I feel that bromeliads look much more attractive in a novelty container than they do in an ordinary pot. I have made some to look like logs, others like tree trunks with holes in them for some smaller plants. My Tillandsia lindenii—did it flower eventually? No, but maybe next year . . .
—279 Mt. Wellington Highway, Panmure, Auckland, N. Z.
N A PREVIOUS ARTICLE I said that the pulverized and sterilized sheep and cow manure sold in commerce could be scattered with impunity over bromeliads. It is a quick and effective way of feeding extensive plantings. However, I have noted above-average incidence of fasciation of floral scapes in a ground-bed of Hohenbergia stellata fed in this manner. Apparently some of the plants in this planting received an excess amount of the plant food. There was no great harm done, because the resulting inflorescences were distinctively attractive in their own right. L. H. Bailey defines fasciation as "an abnormal or teratological widening and flattening of the stem." Fasciation in Hohenbergia may be described as follows: Several smaller, sparsely branched, distinctly separate flower scapes arise from the center of the plant instead of the usual solitary well-branched scape and are arranged more or less in one vertical plane. All or several of the multiple stems may be united at the base to form the more or less flattened stem typical of fasciation. The overall effect of the aberrant inflorescence is that of an illuminated candelabra. With two exceptions the native bromeliads of Florida are of nondescript appearance, including the all-pervasive Spanish moss (Tillandsia usneoides), whose shrouds of "tattle-tale gray" are downright depressing to some persons. However, to others, this somber epiphyte recalls all that is nostalgic of the old South. One exception is Tillandsia fasciculata, which is found in the southern half of Florida, throughout the West Indies, and in Central America. This bromel has attractive gray-green linear-lanceolate leaves about 1½ feet long. Tubular blue-purple florets appear sporadically on many-flowered spikes, these united to form an erect, well-branched scape attaining two feet. The clasping floral bracts may be tinged with various shades of red or may be yellowish or simply green. Happily, the showy red-bracted form is typical and dominant in the swamp-cypresses and hammock oaks of Florida. Fantastic Gardens of Miami list white and yellow forms. The other exception is Guzmania monostachia, a plant with soft green leaves and an erect unbranched spike, whose lower bracts are green striped brown, while the upper bracts are pink. Within each bract is a transient white floret. I have found this plant growing in oaks in the hammocks of south Dade County. Plants dislodged and fallen to the ground seemed to be doing as well as those in the trees. There is a red-bracted form, but this was not found. Anyone who works with bromeliads knows that their spinulose (often unnoticed) or macrospinose leaf margins will scratch the hands and bare arms of the unwary. Few are the plants with soft, spineless leaves, as in the Vrieseas and Guzmanias. The leaf-margins of Bromelia pinguin are equipped with diabolically arranged fish-hooks. This hostile, vindictive plant has something of the aspect of and all the deadly allure of a barbed octopus, almost reaching out to shred the hide of the hapless interloper. Its one redeeming feature is the unbelievable inflorescence, which makes it worth the trouble. A bromeliad classic Neoregelia spectabilis, the "Painted Fingernail Plant," far from being a jezebel, is a quiet beauty that never fails to whet the interest of those seeing it for the first time and is a continuing source of pleasure for those who live with this plant. The contrast between the red tips and the green leaves, which is the plant's forte, is more pronounced in 30 to 50% light than in 60 to 80% light. The more intense light bronzes the plant over-all, and the red tips lose some of their prominence. Full or nearly full sun, in the sub-tropics at least, reduces the plant to a pallid shadow of its former self. The red tips become a muddy pink and the leaves turn greenish-yellow, with some degree of sunburn likely to occur. N. spectabilis is modestly priced, having been in the trade for many years. Its foliar color scheme, rather than the sporadic, sessile blue flowers that appear in the cup, is the important feature of this plant. The Garden Shop of the Sears store in Coral Gables, Florida, recently had a display of flowering plants of Aechmea orlandiana and Aechmea chantinii. These were well-grown plants and were priced at $6.99 each. For an adult plant of A. chantinii this price is a bargain, but for A. orlandiana it is a little high. This peculiar pricing often happens, especially in chain stores, when for the sake of uniformity in price structure, plants that look somewhat alike are priced alike, although they may differ in scarcity and desirability. An attractive cultural booklet with essentially valid information was attached to each plant. On the other hand, there may be an unwitting advantage for a large store like Sears, whose sales clerks are often unfamiliar with relative scarcity of one species of bromeliad as compared with another, to have a uniform price for plants of this kind. There have been instances where shoppers with petty larceny in mind have exchanged the price tags of high-priced and low-priced varieties, and then have taken the more valuable plant to the cash register, where the busy clerk glances at the tag and rings up what is a ridiculously low price for the plant purchased. Uniformity in pricing is usually initiated by the grower, if it does exist. He sets the wholesale price, to which the garden shop manager adds his customary mark-up, which can be as much as 100% when plants of limited "shelf-life" are involved, to arrive at the retail price. —P. O. Box 969, Sebring, Florida. The Bromeliad Society has been asked to be the international authority for the registration of bromeliad hybrids. Until now there has been no place where this could be done. An elaborate system for the registration of orchid hybrids has been operating for many years. We shall follow this system more or less and the procedures recommended by the International Code of Nomenclature for Cultivated Plants. The duties of such an authority includes (1) compiling and publishing lists of hybrid (cultivar) names of bromeliads; (2) registering the names of new hybrids (cultivars), and (3) making known the provisions of the Code among raisers, introducers, and others concerned. About a hundred years ago the hybridization of bromeliads began in Europe where it was concentrated in Belgium and France. Many of the hybrids were described from time to time in articles in horticultural publications. In 1935 Carl Mez in his Das Pflanzenreich listed all of the known hybrids. We plan to check on this list to determine which hybrids are still in existence and to add to our compilation the hybrids made since that time by such well-known hybridists as Mulford B. Foster, of Florida; Walter Richter, of East Germany; Dr. Richard Oeser, of West Germany; Ralph W. Davis, of Florida; Edward W. Hummel, of California; Robert Wilson, of Costa Rica; J. N. Giridlian, of California; and others. The extent to which we shall be able to register their work will depend on the amount of information we get from them. Most of the hybrid bromeliads created years ago have been lost to horticulture. The principal reason for this loss was the destruction of greenhouses in Europe during the First and Second World Wars. Other factors that contributed to this disappearance were the social revolution and the high cost of fuel and labor. The European hybridizers worked extensively with Vrieseas and to a lesser extent with Aechmeas and Neoregelias. Since many of these crosses are now extinct, it is hoped that breeders will be encouraged to remake many of these old crosses with recognition as a reward plus the chance to name the crosses. Most American growers would be surprised at the extent of the list of European hybrids. Hundreds of combinations were made when the culture of bromeliads in the United States was practically non-existent. Name of hybrid if it has a name. Parentage - when possible name the seed parent first and the pollen parent second. This is in accordance with the accepted practice. Name of the raiser and/or introducer. Name of the hybridizer if different from the above. If known, give date of making the cross, the date of first flowering, and the year in which the name was given to the hybrid. Description of the plant, or photograph showing its distinguishing characteristics. The information concerning each hybrid should be put on a separate piece of paper or on a special form which may be obtained from the Society. No fee will be charged for registration in the first publication of hybrids, as no policy in this respect has yet been established. The Bromeliad Society will not publish a registration of a hybrid that it finds has been previously made (unless the previous hybrid had been extinct) or that it disqualifies for reasons used for disqualification by The International Code of Nomenclature for Cultivated Plants. Edouard Morren of Liege, Belgium, made the first bromeliad hybrid of which we have any record. This was a cross made in 1879 between Vriesea psittacina and Vriesea carinata known as Vriesea × 'Morreniana.' It is still in cultivation. Morren's work was the start of a great deal of hybridizing, particularly in Belgium and France. A number of fine Vriesea crosses especially were created, but, unfortunately, many of these were lost in the wars that followed. In the preface of his Handbook published in 1889, J. G. Baker wrote: "Prof. Edouard Morren of Liege was universally and deservedly regarded for the twenty years previous to his death, in 1885, as the highest authority on the plants of this order." There is considerable difference in the three types being offered on the market; this difference can probably be accounted for by the fact that Neoregelia carolinae sported at three different nurseries on the Continent. The most striking form is compact, many leaved, and has pink coloration suffused through its entire foliage even as a young plant, provided good light is furnished. Upon flowering, the center leaves turn a cherry red; this coloring persists for many months, sometimes upwards of a year. The other extreme is fewer leaved, the leaves also being more straplike in appearance. Only upon flowering when the center leaves take on their color do the center leaf areas show any indication of pink suffusion, which tends to leach out after flowering has ceased. The intermediate type, while more compact than the latter, is just as reluctant to acquire the pink coloration in the outer leaves when immature. Only when grown in bright light (50% constantly filtered or nearly so) can the true potential coloration and conformation be attained. With less favorable light, the pink blush in the foliage of the more compact, more highly colored type will diminish or disappear, but the difference is still quite apparent, making the other types scraggly by comparison. NEOREGELIA CAROLINAE "CALIFORNIA JUNGLE GARDENS' SELECTION' —This selected form of N. carolinae is a gem of the first water, being of compact size and having a period of blushing of remarkable beauty and uncommon duration. The blushing is precocious in that the plant is nearly in full color when only half grown, long before the inflorescence can be detected and continues in undiminished beauty even after the offsets themselves are in full color. The quality of blushing of the mother plant is comparable to that of the offsets at their prime, though there is some diminution in the color area. The plants continue in top condition for months, and once a plant is established, color is practically continuous: Desirable though this is, it is the quality of the color itself that is most exciting. It is of a remarkable clarity and brilliance, which is free of any blue or shading to purple; rather it is a yellow-red, close to the scarlet of a poinsettia. Furthermore, the area turning red is noteworthy, since it is much greater in extent than that of the ordinary variety. It is not an exaggeration to report that half the total leaf area changes color. This is a most accommodating plant, being of the easiest culture. Robert Wilson collected the plant originally at Tingua, Rio Para, Brazil, which is about 45 miles from the mouth of the Rio Cupari. Later the plant was acquired from Wilson's Fantastic Gardens by David Barry, Jr., who thereupon threw out hundreds of flowering size seedlings plants of the ordinary N. carolinae, so superior did he regard this particular form. This superb plant is a real acquisition! NEOREGELIA CAROLINAE VAR. MARECHALLII — This is an excellent bromeliad for the greenhouse because of its relatively small size and its compact habit of growth. It is primarily a foliage plant, since it seems loath to flower. It must be kept in strong light and then the entire plant is constantly in color, which may be described, for want of better adjectives, as salmon pink tending toward rust. In subdued exposure the plant is entirely green and undistinguished. The inflorescence appears infrequently and is like the type. This variety was introduced to the American market by Julian Nally, who is responsible for many fine introductions. About 30,000 seedlings were raised in the late 1950's. This form has not proven satisfactory in Florida, where it is subject to phytothorum fungus which results in spotted leaves; but in California, although it is not a frequent bloomer, it presents no cultural problems. —5602 Theresa Rd., Tampa, Florida, (EW) and 4300 Isabella, Riverside, Calif. (WD). Neoregelia carolinae var. carolinae first entered horticulture in 1857 under the name of Bromelia carolinae. Since that time it has had a number of names: Billbergia meyendorffii, Karatas carolinae, Bromelia rhodocincta, Regelia meyendorffii, Aregelia carolinae, and Aregelia marechalii. In his study in "Contributions from the Gray Herbarium" in 1939, Lyman B. Smith gave it the name this plant bears today. This bromeliad, a native of Brazil, has long been a favorite houseplant, and especially Neoregelia carolinae var. tricolor, which is cultivated by the thousands on the Continent. T'S A THRILL TO BLOOM A BROMELIAD, but it's doubly rewarding if that plant came from a seed you planted with your own little hands. The recent publication of the Bromeliad Society, Bromeliads in Color, contains much information about growing from seeds. This will be a good starting place, but initial efforts to propagate some of the more difficult varieties will very likely be met with disappointment. These failures should be looked at as a necessary experience leading to the development of a "feel" for the proper balance of temperature, light, water, fertilizer, humidity, and air circulation. In the process of developing a "feel," many pet methods evolve. Each of these is the best for the individual with his particular environment. A few of these pet methods are outlined. Mr. Ervin Wurthmann, in Tampa, Florida, reports: "I use plastic trays for small quantities of seeds. My soil medium is ½ fine shredded tree fern, ¼ peat moss, and ¼ worm castings, with a little superphosphate mixed in. A cover is constructed to cover the number of seed trays predetermined as sufficient for my purpose. The cover is constructed with two boards 1 inch by 4 inches, held apart with three cross pieces on the top. A handle is installed on the center cross piece and the ends remain open to permit air circulation. The top is covered with vinyl plastic and shade cloth. The shade material should be at least 75% for seedlings. The cover can be lifted off to permit spraying every two or three days, depending on weather conditions. I use a "Foggit" with a fine or medium spray. If there is trouble with damp-off, spray with Chinosal or Terreson. This has never been much of a problem with me. I would say that the medium should be moist but not sopping wet. I have germinated Tillandsia and Vriesea seeds this way. Some of my Vriesea seedlings could flower this fall. I find the addition of worm castings in the medium seems to provide sufficient fertilization to keep the seeds coming on. Incidentally, the same mix is used for Neoregelia, Nidularium, Aechmea, and Guzmania seed. The system serves my purpose and requires a minimum of attention." Mr. David Barry, in Los Angeles, uses a variation to insure a high level of humidity. Instead of a cover with both ends open, an air-tight plastic box is used. These are commercially available as bread boxes. The bottom is drilled with many holes and then covered with a plastic cloth known as "Saran." The planting medium is placed in this lower half. The holes assure good drainage; the cover supports a near 100% humidity. Dr. Richard Oeser in West Germany recently reported in The Bulletin that he had good results when he sowed Tillandsia seeds on bundles of pine branches. Temperature—not lower than 70°F. ; ideal range 70° to 80°F. Light—good light, no direct sunlight. Fertilizer—25% normal concentration each watering. Humidity—40% to 80%, achieved by partial cover of glass or plastic. Air circulation—remove cover once a day until first leaves appear, then leave cover off. Planting medium—a good sandy mix with peat moss. Many factors and combinations are important. The most difficult to achieve is adequate air circulation and a buoyant humidity. Very slow growing seedlings, such as Vriesea, Tillandsia, and Guzmania, will never live to bloom unless during the first few months and even up to over one year, they never dry out, never stay wet, and always have a movement of air. Many times this poses a problem, particularly when there is a sudden change in direction of air current with an accompanying drastic change in humidity. You may have a few disappointments, but a little experimentation will provide the necessary direction to success for you. —4036 Via Solano, Palos Verdes Estates, California. 90275. This is how I plant my bromeliad seeds. I buy aluminum cake pans, 9 ½ by 13 inches, with clear plastic snap-on lids. Sometimes I use clear plastic shoe boxes. I drill holes in the pans, then put in layer of gravel, a layer of fairly fine osmunda or Mexican tree fern fiber. I give this a good soaking, then set it aside to drain. When it has stopped dripping, I sprinkle coarse sand over the mixture till the osmunda is completely covered. Then I sow the seeds, snap on the lid, and set the container where it gets good light. In about 6 or 7 days, the seedlings start to show. As soon as they are all up, I sprinkle more of the coarse sand around the roots to keep the seedlings from toppling over, especially when they need watering. When the seedlings are ready to be transplanted, I plant them in large flats, which I make myself. I use a mixture of osmunda or Mexican tree fern, Perlite, screened redwood sawdust, a handful of sheep manure, and a handful of bone meal. The bone meal does not leach out and likes the liquid fertilizer which I use. I sprinkle granular fertilizer and bone meal on the potted bromeliads. The results are that I have larger plants and much bigger berries than when I used just liquid fertilizer. —Brownie Perner, 128 Tennessee Ave., San Antonio, Texas. When I first tried growing bromeliads from seeds, I met with complete failure, not knowing a thing about bromeliads and their culture. It was heartbreaking not to see even one seedling show its green life from the thousands of hard-to-get seeds that I had planted. "Help! Help!" I wrote to my friends who raised them in the Los Angeles area of California. One very important point that I received from one of my friends was that most bromeliads are epiphytes and usually grow on tree limbs like most orchid plants. For that matter, my friend told me, bromeliads and orchids are commonly seen growing on the same trees in the South American jungle. This gave me an idea. Why not try growing the seeds on chopped or ground-up Hawaiian treefern (hapuu) fiber that can be easily and economically procured in Honolulu? So I tried using hapuu in several ways, but I found that the best method is to soak the hapuu fiber in water and pack it tightly in a clay pot or a flat with a potting stick and then cut off all uneven fiber to create a flat surface. For seeds without filament, such as Aechmea and Neoregelia, I use fine damp hapuu dust on the top of the fiber to prevent the seeds from being washed too deeply into the pot. Seeds with filament can be placed directly on the hapuu fiber without fear of losing them as they cling tightly to the course fiber. By using hapuu as a planting medium, I have had complete success with all kinds of bromeliad seeds provided they are viable. From my first successful planting of seeds approximately ten years ago, my collection of bromeliad plants has now grown into several thousands. —Howard Yamamoto, Honolulu, Hawaii, U.S.A.
Hohenbergia ridleyii is not a plant for those who cannot afford the space to accommodate a rather large specimen, as this bromeliad has a spread of 31/2 feet and has spines of reasonable rigidity, but where one can give it room it is wonderfully graceful—bold and simple, but regal. It possesses a bit of the airy rhythm of a waterlily and commands attention both because of its size and refinement. Its most arresting characteristic is the exciting color of the foliage, which Mr. Merkel, in his catalog, describes as a "very handsome golden yellow," and, indeed, it does approach this description during the long flowering period. Before and after this even the foliage is the green-gold of leaf lettuce, at least under my growing conditions in inland southern California. The inflorescence, while imposing, is of secondary interest. A tall rose-colored stem, generously supplied with a downy tomentosum, rises to a height of 5 feet. Small branches carry cone-like groupings which in form are not unlike the well-known Hohenbergia stellata. The individual flowers are ridiculously small and of a washed-out lavender, so pale as to be easily overlooked. It is apparent, that the inflorescence is more interesting than beautiful. —4300 Isabella Street, Riverside, California. HE PROBLEMS OF GROWING bromeliads in the Chicago climate are many and difficult to solve. Although I live in a house, I have no place to put a green-house, so I grow my plants in the basement mostly under lights, with some bromeliads in windows facing north and west. I am able to put some plants out on the patio—facing north and largely shaded—for about three months in the summer, but I still keep half my plants in the basement under lights even then. In my opinion, the test of successful growing is to grow an offset from bud to bloom. Anyone can buy a plant just coming into flower and have it look nice for a month or two. My evaluation of broms will then be based on my criteria of offset bud to blooming plant. My biggest problem has been getting nice plants. Usually, plants arrive in some shock and have been so bruised in packing that they shortly look like nothing. I received this spring some 20 plants from a large nurseryman, and I could tell that they had been beautiful specimens, but I am sure that the average person would have thrown out 15 of the 20. However, they all lived and I'm growing them, but they are sad looking. When the leaves are bent or broken, they do not recover. Billbergias and any tubular plants ship best because they do not have to be bent. I have been growing bromeliads for four years now, and here is what I have found. Aechmea miniata var. discolor is outstandingly the easiest to grow. I have raised 3 generations under lights. The plant always blooms and keeps a good shape. Billbergia pyramidalis is almost as easy. Aechmea fasciata grown well, blooms and keeps a good form. Aechmea × 'Foster's Favorite' grows well, has many offsets, but has never bloomed. Vrieseas splendens has grown well, has bloomed, has set an offshoot which in turn has bloomed. Vriesea × 'Mariae' grows well. I have two plants, each 3 years old, but so far they have not bloomed. I received Vriesea carinata in bud; it has produced an offset which is now mature and in bloom. The second generation of Vriesea incurvata is mature but has not bloomed, still I am hopeful. I grow Tillandsia ionantha on tree fern slabs which get frequent spraying. The plant has bloomed and I am hopeful of more flowering this year. The two plants I had of Guzmania musaica both died. Two of my three plants of Aechmea tillandsioides died, and the third I gave away to a person who had a greenhouse. The plant thrived. It seems to need high humidity. Aechmea mertensii has had plenty of offsets, some produced when the mother plant was quite small, but this bromeliad is long and skinny and in very poor shape. Aechmea caudata var. variegata produced one offset, but it is long and skinny and is deteriorating. However, Aechmea calyculata is an easy grower. It has bloomed and has seven offsets: Nidulariums generally arrive in very poor condition. I am growing several, but they are not pretty. My second generation Neoregelias all have narrow leaves and poor overall shape. Billbergia × 'Fantasia' is a reliable bloomer, grows well, but I sunburned my plant this spring. Billbergias in general are just so-so. Some bloom, some don't. Some will grow well for a while, but their offsets in time grow spindly. It seems to be a question of what time of the year the offsets come. I have had no blooms from Aechmea triangularis, but the offsets make a nice looking plant. Tillandsia × 'Emilie' is now in bloom and has two offsets. Guzmania berteroniana died in a period of six months. I have tried over a hundred varieties of bromeliads and am now growing 150 plants. I also had 125 orchids, but gave them up last fall. —5832 Emerson St., Morton Grove, Ill.
—Longwood Gardens, Kinnett Square, Pa.
Aechmea fasciata is used effectively with Agave caribbean, Hesperaloe, Italian Stone Pine, and Cycas revoluta to make an interesting garden walk. 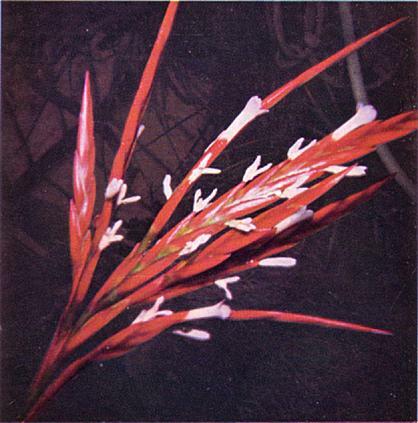 The Aechmea may be kept in its pot and removed when the inflorescence fades. 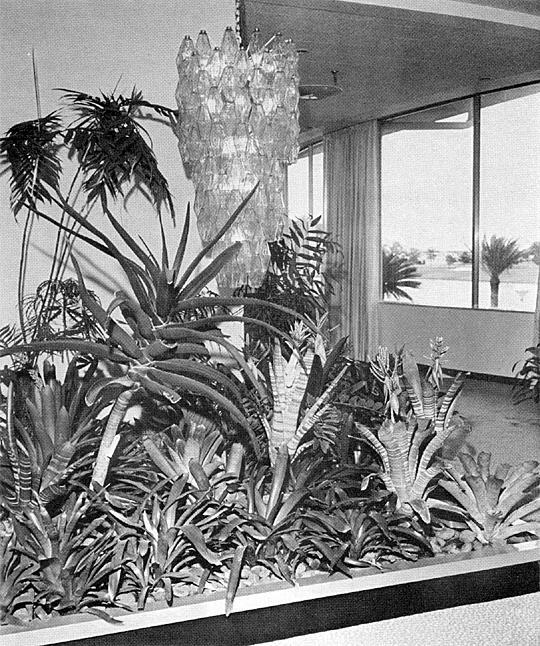 Bromeliads are shown here growing happily with an aloe and a Chamaedorea in an air-conditioned country club in Florida. Even Aechmea chantinii does not seem to mind the artificial atmosphere. OT ONLY CAN PLANTS ABSORB nutrients through the roots, but also through the foliage, the fruit, the twigs, the trunk, and even the flowers. This is the conclusion reached by Dr. Tukey, head of the Department of Horticulture at Michigan State College, in a meeting of the Research and Development Subcommittee of the Joint Committee on Atomic Energy. Radioisotopes were used in the investigation that Dr. Tukey reported on. The Atomic Energy Commission cooperated in the project. Radio phosphorus and radio potash were used. These in the wintertime were made into solutions; cotton gauze was dipped into them and wrapped around the branches of a tree and then tested for radio activity by means of a Geiger counter. Within 24 to 48 hours, even in midwinter and at below freezing temperatures, these materials were found in vertical branches 18 inches to 2 feet above the point of application. Further, these materials tended to accumulate near the bud, and so, from these tests it was established that nutrients can enter dormant branches. The same procedure was followed to investigate the entry of materials through the leaves. The leaf was found to be a very efficient organ of absorption. The material moves into the upper surface of the loaf as well as the lower surface. It was also found to enter both at night and day. After the nutrient enters the plant, whether it be by leaf or branch, it concentrates in the growing tips of the roots even way down in the soil. Commonly it accumulates in the most actively growing regions. If application is made to the leaf in the middle region, the material will move into both the root system and the upper leaves. Materials applied to the leaves were utilized about 95%, whereas only about 10% of the material is utilized if applied to the soil. Calcium behaves quite differently. If applied to the foliage it moves into the plant, but it does not move down to the roots with any great degree of freedom. Applied to the soil, it moves upward through the entire plant. Applied to the leaves it does not appear in the roots. Certain parts of the plants need certain nutrients at certain times. For example, when a seed is forming in a strawberry, phosphorus concentrates in the seed. In the case of an apple, both phosphorus and magnesium concentrate in the seed when it is developing. In some cases, magnesium deficiency shows up in the foliage when the seed is drawing magnesium. During the period fruit is developing, phosphorus from foliar application will appear in substantial amounts in the fruit in a relatively short time. Help needed! 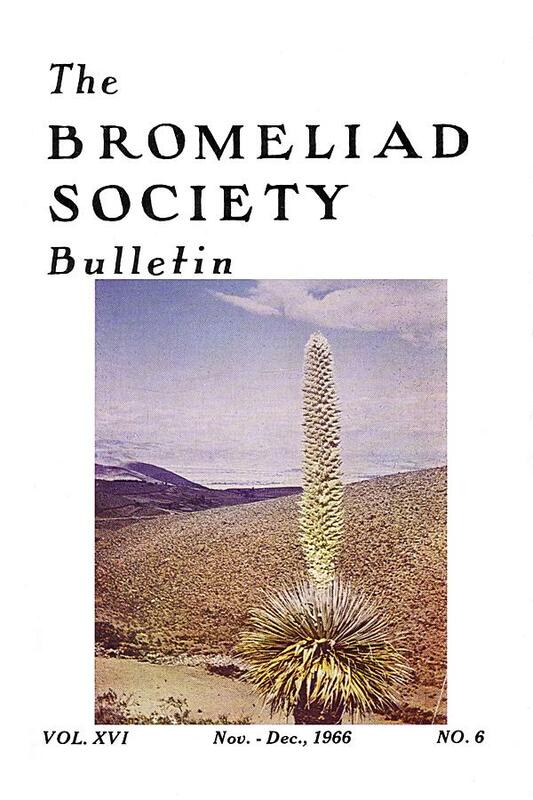 Many old issues of The Bromeliad Society Bulletin are no longer available, but still the requests come in for them. The most sought-after issues are No. 1 for the years 1958 and 1959. If any member has extra copies of these bulletins, will be please get in touch with the editor. There are some members who would be most appreciative. Yes, time does fly, and already a new year is dose upon us. This is your last bulletin for 1966 and the last you will receive unless you send in your renewal. The Bromeliad Society Bulletin for 1967 will contain many highly informative and entertaining articles which no bromeliad grower—whether he be novice or expert— can afford to miss. Please don't wait to renew until later, but slip your check in the envelope and mail to Mrs. Jeanne Woodbury, 1811 Edgecliffe Drive, Los Angeles, California 90026. Then, you will be sure of receiving Bulletin No. 1 for 1967, which will contain the first of a series on Vrieseas. All renewals must be accompanied by cash payment—the Society is not equipped to carry accounts or to bill foreign memberships. The above inflorescence is that of Tillandsia didisticha, approximately life size. The plant had been in flower for about three months when this photograph was taken and was to remain in color for about three more. This Tillandsia is indeed a very attractive plant, well worth deserving of a place in every bromeliad collection. Tillandsia didisticha (E. Morren) is native to Argentina, Paraguay, Bolivia, and Brazil. It has undergone a number of name changes since it first entered horticulture in 1881; E. Morren first calling it Anoplophytum didistichum and Wittmark, Guzmania complanata. The plant with its silvery, stiffish leaves measures about 10 inches in height and about the same in diameter. The leaves form a loose rosette from which emerges the main flower stalk well above the leaves. Numerous smaller inflorescences also may appear in the axils of the leaves during the course of several months.